Happy Friday! I'm pretty sure my blog thinks I have broken up with it because I don't think 2 weeks between posts has happened since I started blogging in 2014, not even when one of my girls was born!! My time catching up here is totally lacking these days, as we are out and about almost 7 days a week, enjoying the beach or park or backyard, pool party playdates and then spending time as a family in the evenings when Dustin is home from work. I am just trying to soak up every bit of summertim! So if you're still here I appreciate you sticking with me and hope you have been enjoying your summer as much as we have!! So a few things I want to share today! First of all, even though it's almost August (seriously?? ), we have about 5 more weeks of summertime here before Olivia starts her 2nd year of preschool in mid-September. So I wanted to share my favorite summer essentials, most (if not all) of which work year-round! I also wanted to get feedback from you guys on what posts you'd really like to see as we move toward Fall, both here on my blog, on instagram @blessednestblog and in my instastories. Do you want to see more easy weeknight recipes like I've been posting? More motherhood stuff? Natural lifestyle? 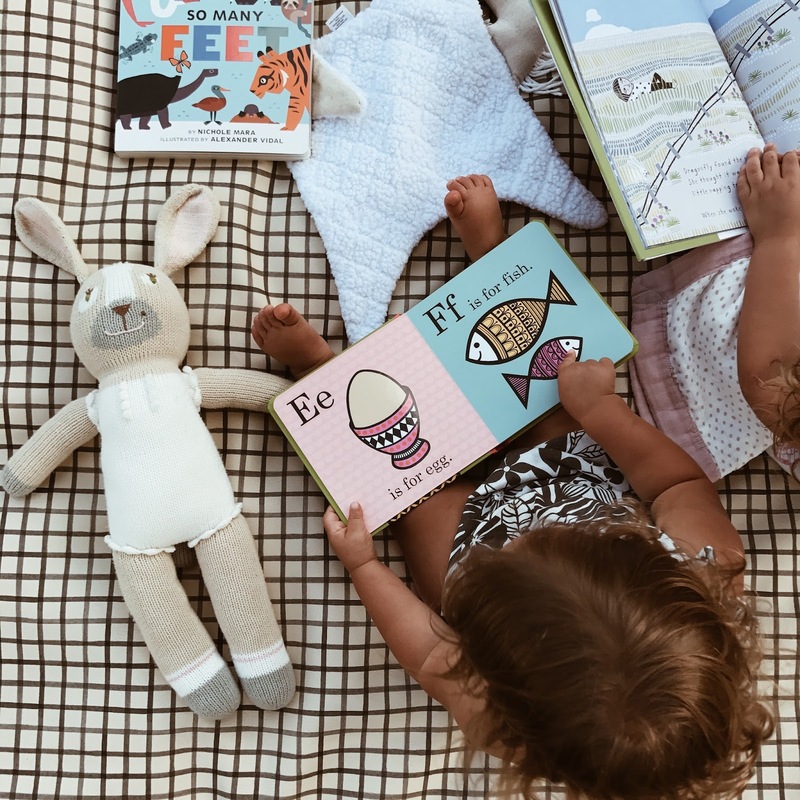 More on children's books? Our schedule as a family of 5? Our home? Can you guys please do me a huge favor and leave a comment below with some of the things that are most important to you so I can be sure this space is always filled with what you most enjoy seeing and reading! And last but not least, I wanted to share a little bit about something that is close to my heart. A local friend of mine, Jen Jacobs, is an incredible Mama to 4 little ones (ranging from 8 months to 5 years) and was recently diagnosed with an aggressive form of brain cancer, with a tumor near her brainstem that is inoperable. There is going to be a huge auction held on instagram @forjenjacobs, from August 25-30. There will be so many incredible items to bid on, including a 4Moms Moxi stroller (for those of you who entered my giveaway but didn't win), baby carriers and slings, clothing and accessories from the best of the best baby + kid shops, gift cards donated by so many neat brands, and more! So if you are looking to get a few new items for Fall, baby gear or something for yourself or a gift, you can do so by bidding at the end of August and supporting Jen and her beautiful family because 100% of proceeds go directly to her. You can follow along with the auction page here and updates will be posted on there!! Our favorite place for finding gorgeous heirloom quality bonnets is Briar Handmade, and the added brim on many of their bonnets is perfect for summertime sunshine. One of my favs for Della is this Rust one, totally gender neutral and such a timeless color. We have so many Briar bonnets that we've had since Olivia was a baby, so it's been fun to pass them down to Poppy and Della as they grow. Melissa & Doug Sand Toys. 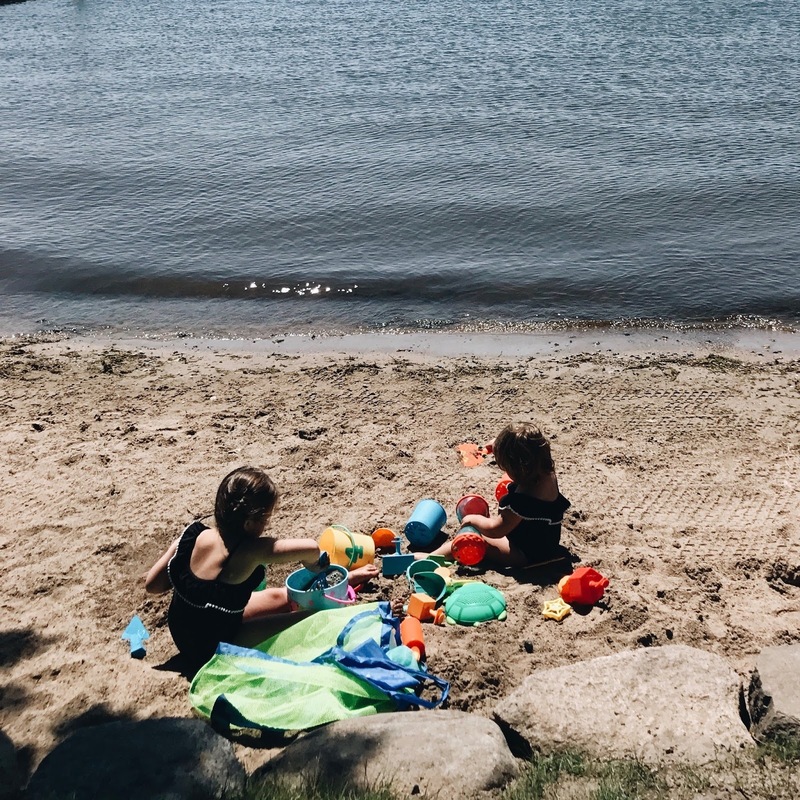 The girls could probably spend the entire day playing in the sand, whether at the beach or our favorite local nature center that has a huge area for sand & water play (where we were yesterday on a playdate!). I recently picked up these sand toys and the girls are loving them: seaside nesting sand pails, sandblox, sand baking set and sand cookie set. For sand toy storage, I am loving this beach mesh bag, perfect for shaking out the sand and it folds up into itself to save space. This Wet-Dry Bag is perfect for all our summertime outings; I also love that it's super neutral and totally practical. I searched high and low for the perfect beach bag that would fit not only suits and multiple beach towels, but a small cooler for mine and the girls' lunches, the girls' water bottles, extra clothes, snacks (of course), beach shoes and more and I settled on this Saltwater Canvas one. I ordered it in June and love it so much; many of my friends have ordered their own after seeing mine. Rather inexpensive, so functional and easy to clean/shake out before leaving the beach. This lunch box for packing mine and my girls' lunches for a day out and about. My glass containers stack perfectly and there is still room for icepacks. I love that there is a zipper pocket in front, which I store a travel pack of our fav Parasol wipes and extra utensils. Then there is a mesh pocked on one side, where I can put snacks that I don't want to get cold or crushed inside, like pouches, apple chips, crackers etc. Lightweight and just the right amount of space for day trips. We spend a lot of time in the backyard and the girls are always wanting to sit on our patio chairs but for Poppy they are still a bit too big. I picked up these Melissa and Doug folding lawn chairs for the girls (matching of course, as to avoid any arguments of who sits in which) and even though they are little bright for my taste, the girls LOVE them and I love that they collapse for easy storage, unlike most kid chairs that are stuck the size they are and then need to be stored all winter long. They come in a few styles, just scroll down to the bottom of the linked page to see all the options! This blow up pool. The sprinkler and pool are two of the girls' favorite purchases all summer. Fun fact: I didn't have an air pump on hand when I was trying to get the pool set up for the girls one morning and Dustin was at work, so I decided to get creative to use my Dyson hair dryer to blow it up and you guys, it was amazing!! I used it on the level 3 power (the highest) and coldest temp setting and in minutes it was set to go. So if you're ever without an air pump, give your hairdryer a try! Happy Friday! It seemed like Monday dragged on with the girls' interesting behavior... (seriously, was there a full moon??) and then the rest of the week just flew, and I can't believe Friday is already here!! We spent all day at the beach and on a nature walk with friends (11 kids total and 4 of us Moms) and now the girls are napping so I'm catching up on laundry before we dinnertime. Here are a few Friday favorites to kick off your weekend! one | Our favorite Briar Handmade bonnets are on sale this weekend for their semiannual sale, so it's the perfect time to stock up. 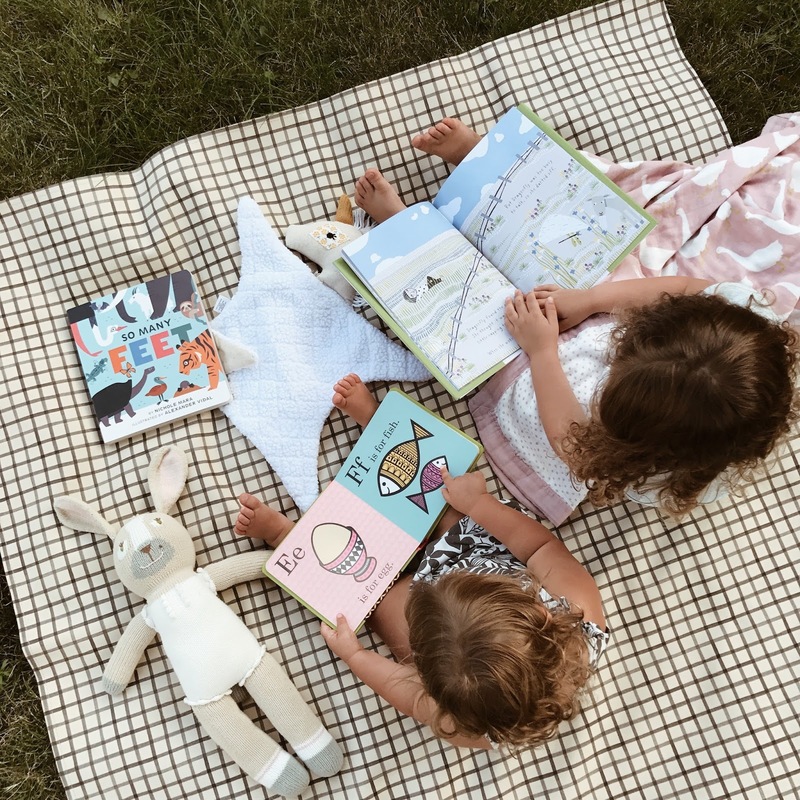 All 3 of our girls have worn these since birth, and they are timeless and heirloom quality, so they are the perfect keepsake to pass down from child to child. There are lots of gender neutral options and the brimmed bonnets are perfect for Summer! To shop their sale, simply visit the website, pick your favorites and checkout, no code needed. All the prices are already reflective of the discounts and domestic shipping is also free. 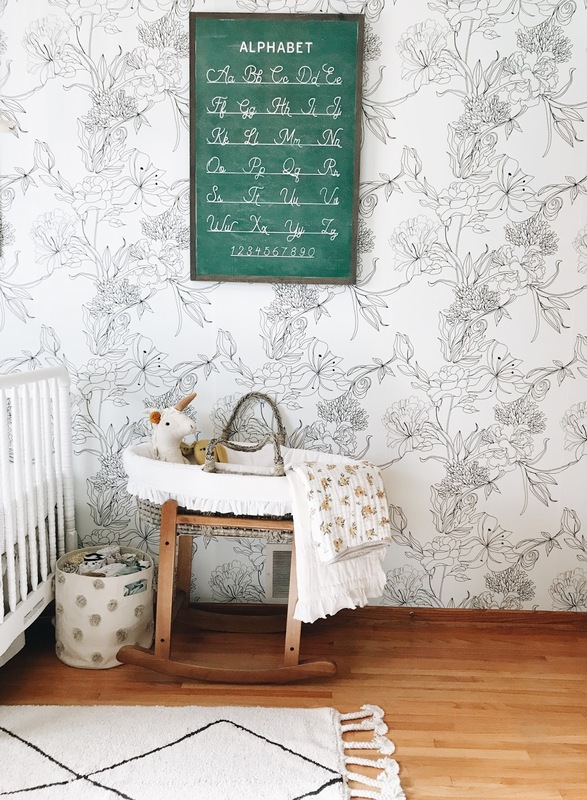 two | I absolutely love this newly released quilt from Little Unicorn and am 150% sure if I ever had a baby boy, it would be my first purchase for him. I grew up going fishing all the time with my Grandpa and I love the simplicity of the quilt, the serene colors, everything! three | Our favorite classic & simple bows for Adaline are from Billy Bibs. They come in a regular and mini size, and Della wears the regular but the mini would be so sweet on newborn babies. We love everything from Billy Bibs, including the gorgeous handmade bibs, but the bow sets are just so darling and make a thoughtful gift for showers and new Mamas. You can save 15% off your total purchase through the end of July using code BLESSEDNEST15 at checkout! five | I picked up these jammies for Olivia and Penelope and these for Della to match earlier this week when Gap had an additional 40% off the sale prices. The sizes are pretty picked over now but they are so cute!! Poppy loves Minnie Mouse, even though she has never watched the cartoon or really seen anything about her. There is also a long sleeve version here for cooler weather ahead this Fall and a matching footed version here and both those you can grab at 40% off since they're not already on sale, using the code NOW at checkout. Always be sure to enter the code PLUS10 at checkout if you're a cardholder to get an extra 10% off every purchase. AND if you're a Silver cardholder, you can select the 3-5 day shipping option for $7, enter the code MYCARD at checkout and it will take the $7 off so you get free shipping, no minimum, on every order. six | On Mondays in July you can get a free kids meal with the purchase of any burrito/salad or order of tacos at all participating Chipotle restaurants! That is one of our favorite spots for quick, quality Mexican food and being able to get the girls' meals free is just a bonus! One of the very first purchases my husband made on Etsy was a wood sign with lyrics to one of my favorite David Crowder songs; it was a gift for my 24th birthday in 2014 and we have it hanging on our dining room wall, I see it each night as I sit down for dinner with our girls and I still love it just as much as when it first arrived. A year later, I purchased another sign (here) from the same shop to hang above Penelope's crib that still hangs there today, featuring one of my favorite quotes of all time. Over the past few years since first discovering House of Belonging, their gorgeous handmade signs have made their way in to our home and have become treasured keepsakes that reflect our family, our faith and our rustic yet classic decor style. 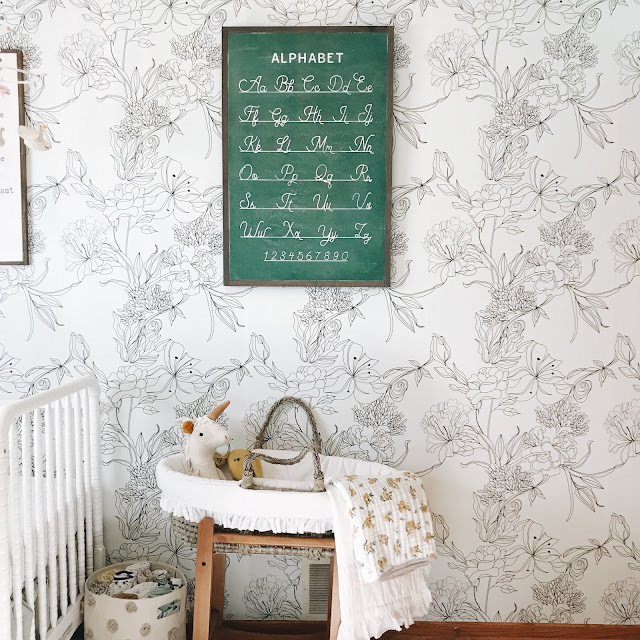 I recently had the opportunity to add a piece from House of Belonging's new collection to Adaline's nursery and chose this vintage alphabet sign. I love the classic chalkboard colors, the beautiful script and the timelessness of the design. It was the perfect piece to hang above Della's (now outgrown) Moses basket, another special heirloom we'll always hold on to. House of Belonging was founded by Tiffini, a Mom to 5 grown children and one teenager still at home. After experiencing many hardships in succession from a young age, she pursued Jesus and journaling, which ultimately led to her healing, new beginning and passion for creating each work of art. An entrepreneur by trade, Tiffini also has the biggest heart of anyone I have ever had the privilege of working with. She is so incredibly kind, talented and encouraging. Her heart for House of Belonging is that it connects people to God's heart -- building homes, families and lives through the power of words. ladies love a gentleman sign -- how perfect for a little boy's nursery!! Tiffini is such a joy to work with and with new pieces continually being released, I am always finding signs to add to my wishlist. I've teamed up with House of Belonging to give away a $150 shop credit to one winner to pick out a sign of their choice! Head on over to my instagram feed @blessednestblog to enter. Leave a comment below for an extra entry sharing why you'd love to add a HOB sign to your home! Giveaway runs today through Sunday July 16. Winner will be randomly selected and announced on the original instagram post within 48 hours of the giveaway ending and will then have 24 hours to claim their prize. 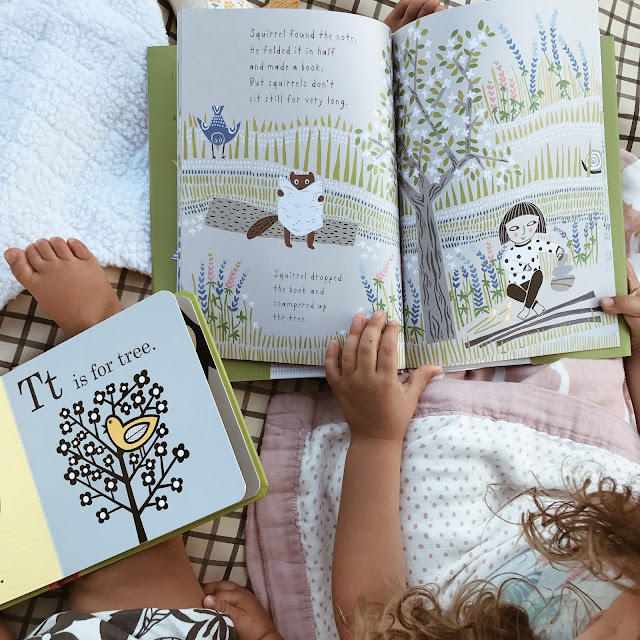 We are always adding new children's books to our collection and yesterday on our day date, Olivia and I chose a few new favorites to bring home. We try to go on a date just the two of us at least once a month, and it usually looks like this: a refresher to share at Starbucks, a trip to her favorite local bookstore, lunch at Chipotle, grocery shopping and then a fun new activity at home together while her sisters nap; yesterday we made strawberry rhubarb crisp and then did watercolors. Now having 3 little girls, I just cherish the one on one time I get to spend with my first baby girl. Here is what the girls are reading & loving right now. Poppy is 22 months and she is the board book queen. The bottom bookshelves in her room are overflowing with board books and she insists on reading 10 every night before bed. Of course she's so cute when she says the words and points out everything in the pictures, so I always comply. Her favorites right now are the Jane Foster board book series. She especially loves Jane Foster's Animal Sounds and Jane Foster's ABC and Jane Foster's First Words. 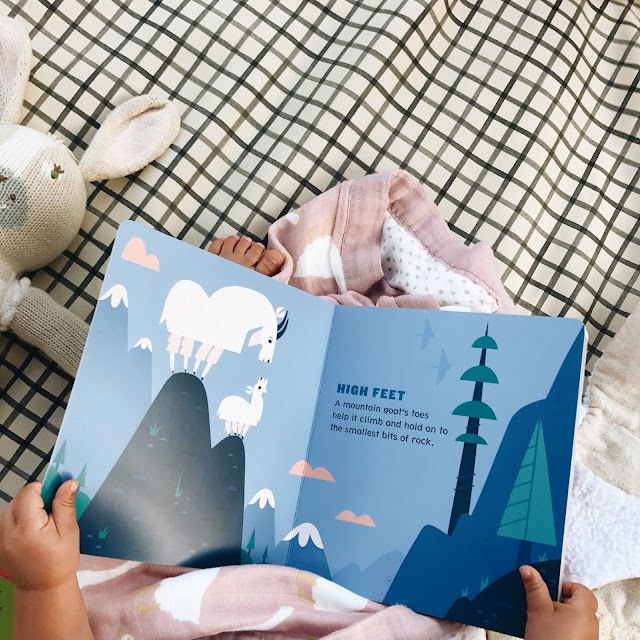 Another favorite right now is So Many Feet, a colorful board book that teaches all about different kinds of animal feet with fun and quirky illustrations and simple facts. I shared in last week's Friday Favorites post they are also loving Gotta Go Buffalo, which is a board book that has flaps to lift on every page. Due to Poppy's excitement of ripping basically every flap off, they have been taped and retaped about 50 times but it remains a favorite, especially before nap time. Poppy points to it on the shelf and yells, "Buppalo! Buppalo!" on the daily. Olivia chose the book I Wrote You A Note by Lizi Boyd, which has been on repeat since we brought it home. Boyd's charming illustrations are easily recognizable (we love her book Flashlight, especially for summertime) and the story is so darling, all about a note a little girl wrote to her friend that got passed along from animal to animal and the adventure it had as each animal put it to use in one way or another. You can find all our favorites listed and linked in my A-Z Lit List post here. As always, if you have favorite books to share, I'd love to hear them! Hope your week is off to a great start!! We are still pretending the long weekend hasn't actually come to an end by continuing our grill-outs, beach days and backyard fun. Dustin went back to work on Wednesday after a 4-day weekend and is staying very busy. His days are long (he told me he got up at 3:50am yesterday morning to get to work by 5:15am, no thank you!!) so we have been trying to make the most of the evenings together as a family, especially when the weather is so beautiful. We had a really fun, low-key 4th of July with lots of pool parties, friends & family, campfires & s'mores, burgers (on pretzel buns, my favorite! ), popsicles, a few beach trips and fireworks. My Dad bought the girls sparklers and snaps and they had a blast with those all weekend long. I remember doing both as a little girl so it was fun to watch them make the same memories. This summer the weeks are just flying by and I feel like I am on my phone, blog and instagram much less than usual, which is so refreshing but also leaves this space here extra quiet. So I thought I'd share a Follow Friday to kick off your weekend! 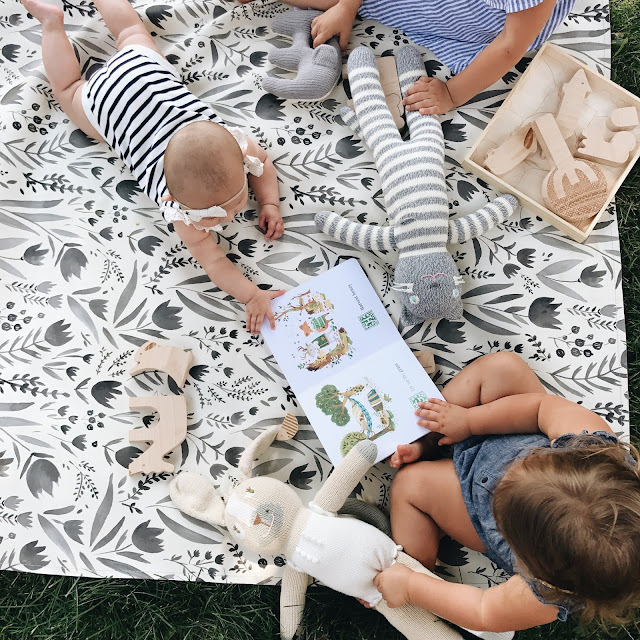 one || One of our fav brands, Childhoods Clothing, released their new camp line yesterday and there are so many pieces I am loving but the new skirts with pockets are darling and perfect to wear all Summer into Fall. I also love the short sleeve henleys, especially the Camp Green color, which I can't wait to put on Poppy! two || If you've seen any of my grocery tour stories you will know we love cookies. One time all the girls were having meltdowns as I was checking out at the grocery store and the lady felt so bad for me that she gave me a kitchen sink cookie to take home and we are now totally hooked on them. Our Whole Foods had samples out of these white chocolate macadamia nut cookies when we went grocery shopping earlier this week and you guys, they are so good. I picked up a pack to bring to our beach playdate today but not eating them beforehand took all the self-control I had. 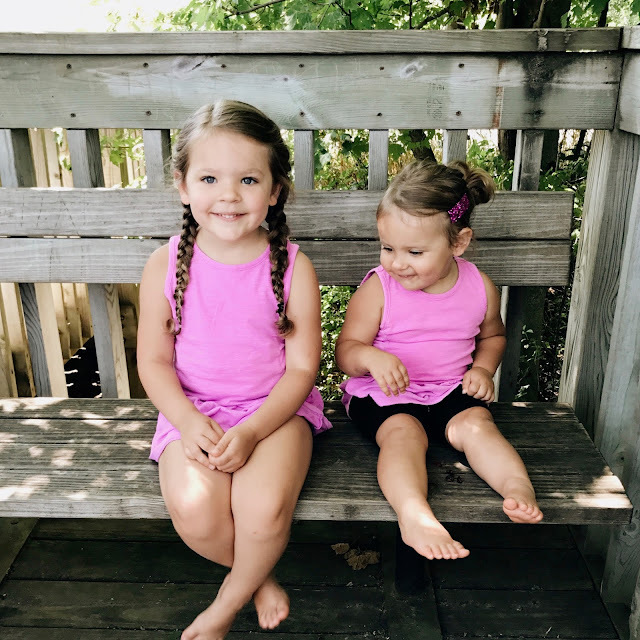 three || I feel like the girls live in their swimsuits these days and we are either running through the sprinkler, headed to the splash pad or spending the day at the beach. I picked up these hooded cover ups for Olivia and Penelope (in white) and they have been so handy for all our summertime adventures. In the mornings before we head out, I dress the girls in their suits and cover ups, and then coming home they just wear the cover ups and I can easily rinse the girls in the tub before nap time. All I have to pack is an extra diaper for Poppy and a pair of underwear for Olivia instead of bringing a change of clothes for each of them on top of everything else I'm lugging along. They are warm and cozy without being too hot and the girls love putting them on and zipping them up on our way out the door. four || This book is the girls' current favorite. Poppy has so much fun lifting the flaps, so much so that I think they have been taped back on about 50 times. All day long I hear the girls saying the cute phrases from the book and I just have to laugh out loud every time. A great summer read with bright colors and such fun illustrations! five || Our favorite latte bowls were just released in a gorgeous bright blue SLATE color that scream summertime. We have a handful of different colors and love them for everything under the sun. We also love their latte mugs.